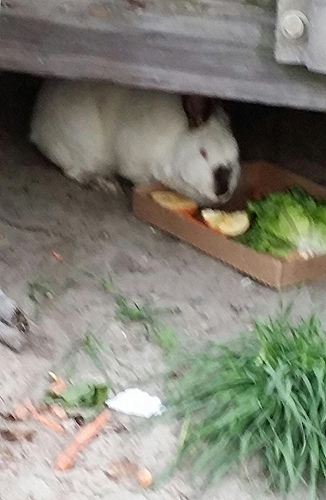 Coney Island was named Conyne Eylandt –Rabbit Island– by the Dutch after the wild rabbits that lived here in the 17th century, but for the past 1-1/2 years the only coney left in Coney has been a Californian breed of domestic rabbit living under the boardwalk. 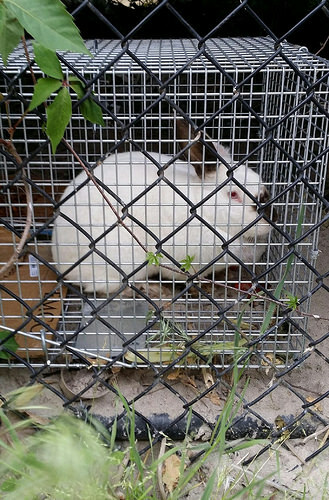 A few days ago ATZ received news of its capture from William Leung, whose previous rescue of a rabbit he would name Steeplechase after Coney’s famed park was featured in “Coney Island Bunny Rescued After 21 Days on The Run” (January 18, 2014). 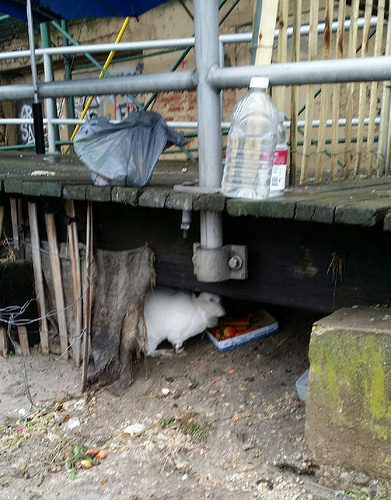 The second bunny who ran off during the bulldozing of the Coney Island Community Garden was rescued on May 27 after surviving for 16 months and two winters under the Coney Island Boardwalk! It’s an amazing story of the compassion and tenacity of both William and Tatyana Leonova, a caretaker of the Boardwalk’s feral cats, who fed the rabbit vegetables as well as the dry food on which it managed to survive through the winters. “It’s been almost a year and half now since Steeplechase was caught and has been living with me,” writes William. “She has bonded with my two little ones as seen in a pic taken a month ago, from left to right: Duchess, Chad, and Steeplechase. 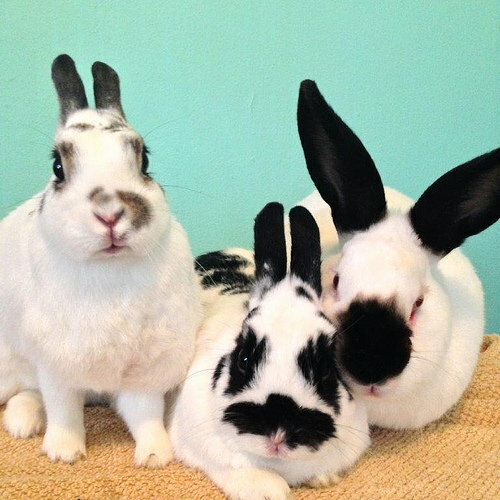 But there is another story to tell about Steeplechase’s siblings.” Since the garden was bulldozed in December 2013, William heard there were up to three rabbits in the garden from the time they were babies. In the summer of 2014 he learned of a rabbit sighting in the same general area where Steeplechase was caught and made the trip from his Queens home to investigate. “But this time of the summer, the grass and brushes were as tall as me, and as I peered through to where the garden used to be, there was no way anything could be seen,” William recalls. “But as luck or fate would have it, Tatyana Leonova, one of the dedicated feral cat care givers passed by and got curious about me poking at the fence. She told me about the sighting of a rabbit running around and said she had been trying to feed it, but didn’t see the rabbit regularly. I asked her if there was a way to trap the rabbit, if they do I will take it.” Tatyana agreed, but as the months passed and winter came to the boardwalk, there was no word. 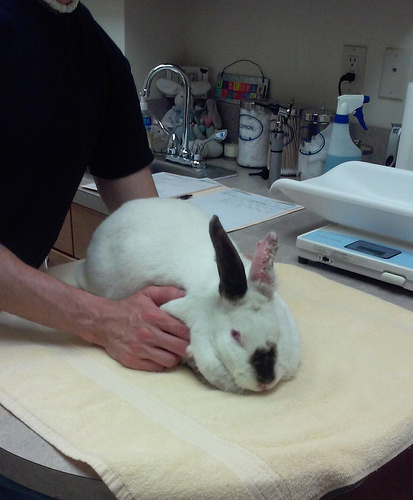 “After 5 days and still no luck, Tatyana was getting worried as she thought the rabbit seemed sluggish and was sick but there was nothing I could do, as I was out of ideas. But the very next day, on Wednesday night the 27th of May, I got a series of panicked calls that she had caught the rabbit but couldn’t get the trap out thru the fence.” William drove to Coney Island as soon as he could to fish the trap out. 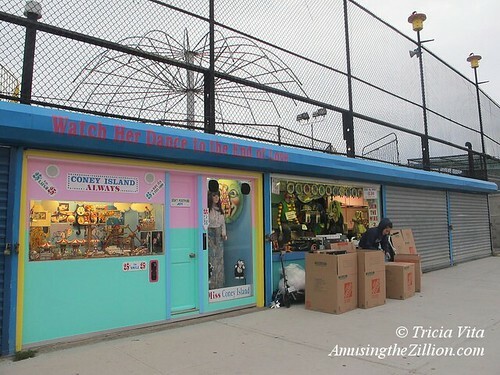 The famed life-size dancing doll “Miss Coney Island” and the miniature animated rides of “Coney Island Always” are getting spruced up today in anticipation of Coney Island’s official Opening Day. Palm Sunday is just two weeks away on March 29th. Window washing and replacement of some of the novel items on display are currently underway. 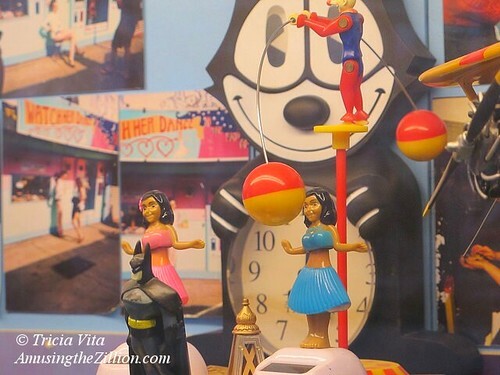 The big news is that one of Miss Coney’s dancing cats is retiring and a dancing white rabbit doll is getting the spot. This means that Miss Coney Island will have possibly the only coney in Coney! Coney Island was of course named Conyne Eylandt –Rabbit Island– by the Dutch after the wild rabbits that lived here in the 17th century. These whimsical, independently owned amusements cost only 25 cents each to enjoy and along with games of skill such as Skin the Wire and Feed the Clown are located on West 12th Street beneath Deno’s Wonder Wheel Park. If you would like to spend the summer with Miss Coney Island and her friends, games operators are needed for the 2015 season. Apply in person or tweet @MissConeyIsland. The sea rabbits that swam ashore on Coney Island beach near West 28th Street on Easter Sunday will be up for adoption today. This unique sea-dwelling rabbit was believed to be extinct in the wild until yesterday, when two fishermen walking west on the beach towards Sea Gate saw several of the web-footed rabbits scurrying ashore. “I couldn’t believe my eyes,” said Mikey, a resident of Avenue U, who had come to Coney to fish from the pier but found it closed for repairs. A local animal rescue group picked up the sea rabbits and plans to put them up for adoption or foster care. ATZ was unable to reach Dr. Takeshi Yamada, the world-renowned expert on the species, for comment on the discovery. Yamada is currently filming the AMC TV reality series “Immortalized.” According to his research, the sea-rabbit is a close relative of the sea lion, and was officially discovered and investigated by Henry Hudson when he first visited this land to colonize the area for the Dutch government. Coney Island was named Conyne Eylandt –Rabbit Island– by the Dutch. 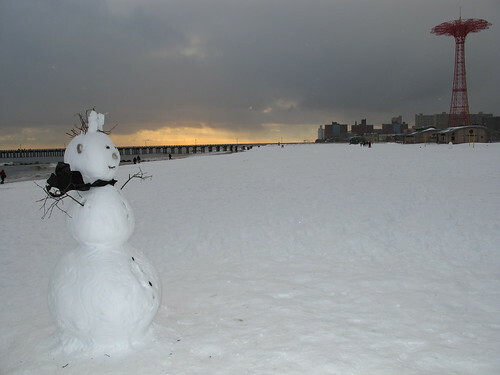 Coney Island resident and contributing photographer Bruce Handy/pablo 57 went for a walk on the snowy beach and came back with photos of a coney-eared, that is a rabbit-eared, snowman. It’s very clever since Coney Island was originally named Konijn Eiland, or Rabbit Island, by the Dutch. “It’s a snow mermaid, started out male and then someone put bunny ears on him, now female. Hermaphrodite snow mermaid,” says the photographer. “Looka, looka, looka step right up, only in Coney Island.” S/he is ready for her/his closeup here. October 30, 2009: Nov 1: Coney Island Polar Bear Club’s First Swim of the Season!